Since the last update we had visitations from Debra and Gordon (S’s sister & husband). They seemed to enjoy their visit though I have been banned for documenting with pictures just how relaxed G was at times – he’s prone to a nap! The night before they arrived I was walking to the chapel with the ever enthusiastic Archy and saw smoke coming from the neighbouring field. Having established the single wire fence was electrified – the hard way – I went under and found that the only remaining bale in the field was afire. Going back I spoke to Mike then returned with a bucket and the other trainee pompier third class (Archy). Avoiding a second shock I carefully poured water onto the two smouldering areas from handily positioned water filled thing. It was hard work but I made sure the smoking/steaming had well and truly stopped before wandering back ashy and slightly damp. Archy having had a couple of drinks from my bucket seemed happier to check the surrounding area for other fires than take a turn with the extinguishing! We arrived at the airport just as D & G’s plane touched down and headed back south to the wee hoose. Showing them the lake and going along to the Chapel. On Saturday we pottered about having dinner in Vice Versa in SYlP – I’d suggested going inside which was good as others scurried in as a thunder storm arrived. I had the beef and after Gordon had a boudin blood sausage starter which he seemed to like. On Sunday we went to Pompadour in search of an event, after coffee we realised it was in Beyssac. Having scoured the area in and around the small village we could only presume it had been cancelled due to the fact it was raining. Others seemed to also be searching fruitlessly… In Scotland even less would happen if that was the rule! We instead went for lunch in Pompadour where S had difficulties getting anything, the upshot seemed to be they didn’t do a meat free salad – despite the easy mechanics of making one and them being on the menu… An English chef came out instead suggesting a filo pastry parcel dish without lardons. The egg within wasn’t to her taste but I enjoyed helping her clear her plate after my duck dish. She’d got a gin despite only ordering a tonic water so wasn’t that bothered. 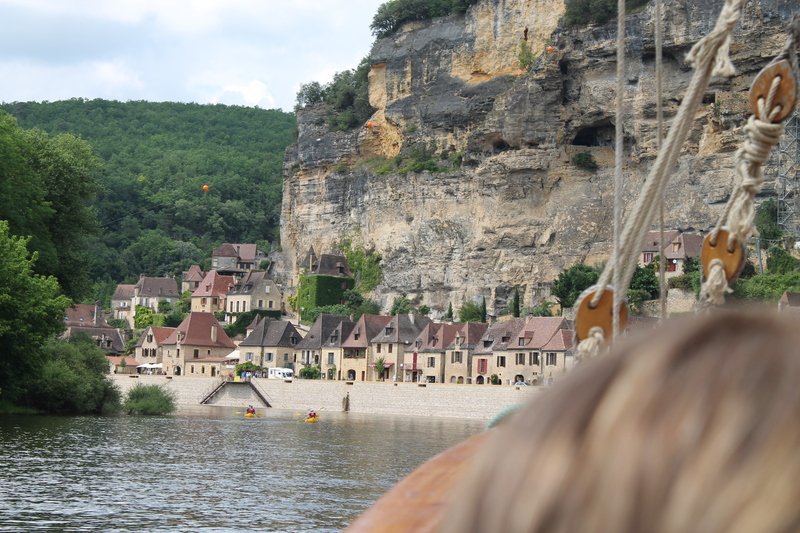 Out next excursion was a boat trip along part of the Dordogne river. 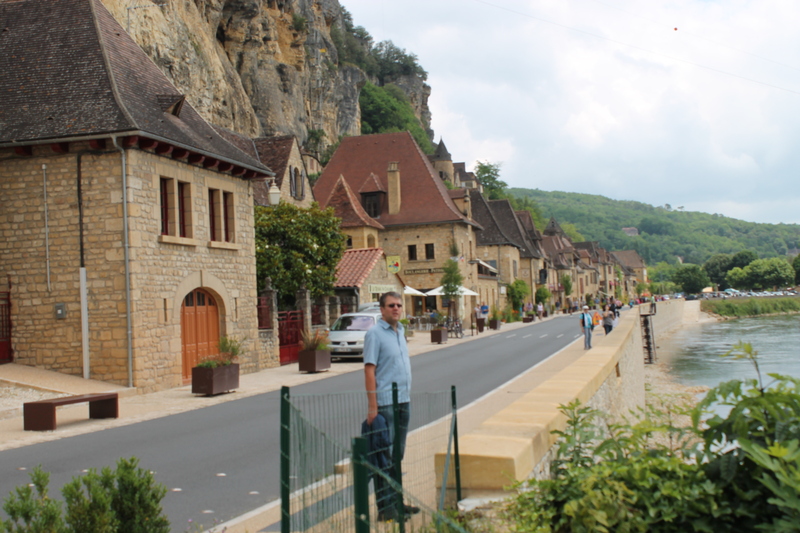 Arriving in La Roque Gageac we realised that it was actually worth seeing itself – one of Frances Plus Beau Villages. Sandwiched between cliff and the river it’s rather beautiful and we wandered along pausing for lunch – the special was a salad with duck four different ways. Four, count them smoked, pate, geziers and a confit! C’est magnifique. I think the others enjoyed theirs in the sunshine too I was somewhat distracted. FOUR WAYS! I did mention that didn’t I? The caves above the village had been populated for many millennia and there was a fall of rock killing three residents in the late 1950’s. Some work is going on to shore it up via an ingenious crane hung from cables secured to the rock face and across the river. Due to the south facing rock faces the place has a bit of a micro climate and we wandered between banana trees on our way for a fortifying ice-cream/sorbet before heading for the boat. La Roque Gageac had been ravished by my old cousins the Vikings a thousand years or so ago. 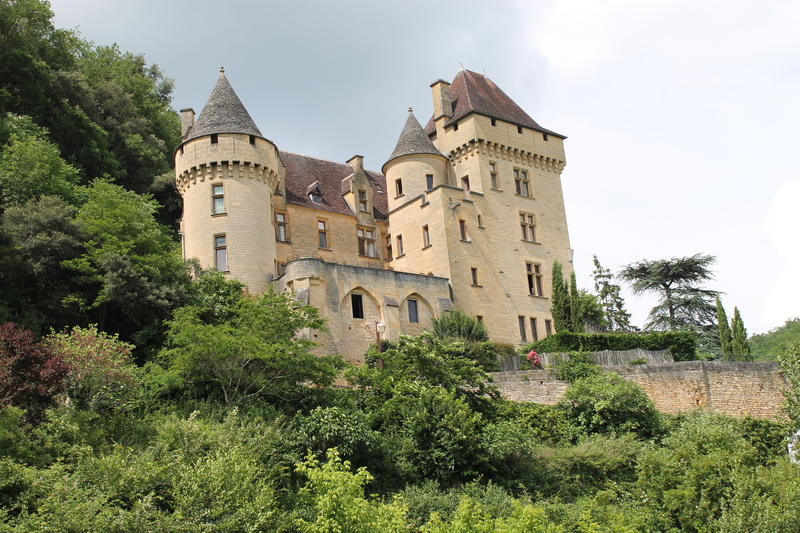 Anyway, we got on a flat bottomed boat and meandered along with the river as various sights and chateau were pointed out. The river was vital for trade throughout history despite being impassable much of the year. Turning at a bridge looking up at Castelnaud Chateau, a section of said bridge was blown up the locals to delay the German re-enforcement of Normandy in June 1944. 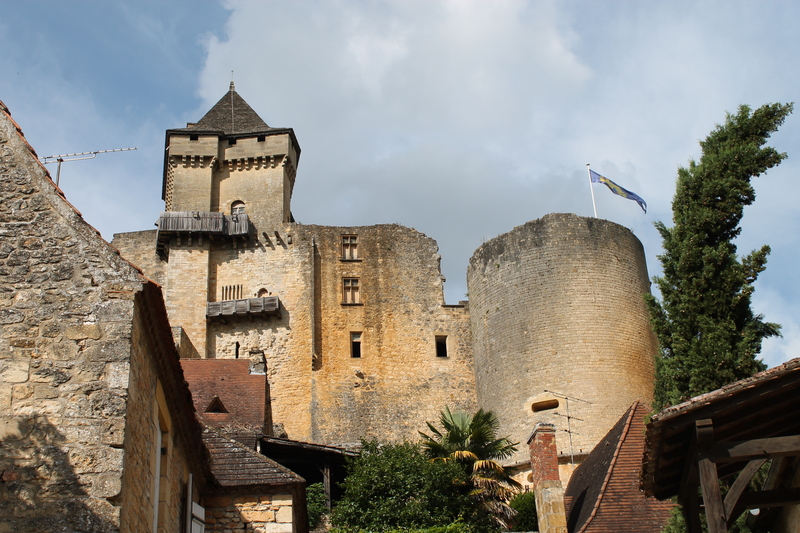 We drove down the Chateau at Castelnaud – one of France’s most visited – due to it getting late and the surprisingly high cost didn’t go in for a closer look. Making do instead, with the views from the petite Plus Beau village. Heading back we spotted another good looking Chateau on another hilltop and diverted to try and get a pic of it as well. After avoiding someone trying to reverse into us as we got cash by the time we’d got back D & G were used to the odd driving style of some other road users. I need to hug the apex and not squeal with horror as someone hammers around the bend half over the white line appearing surprised at oncoming traffic. 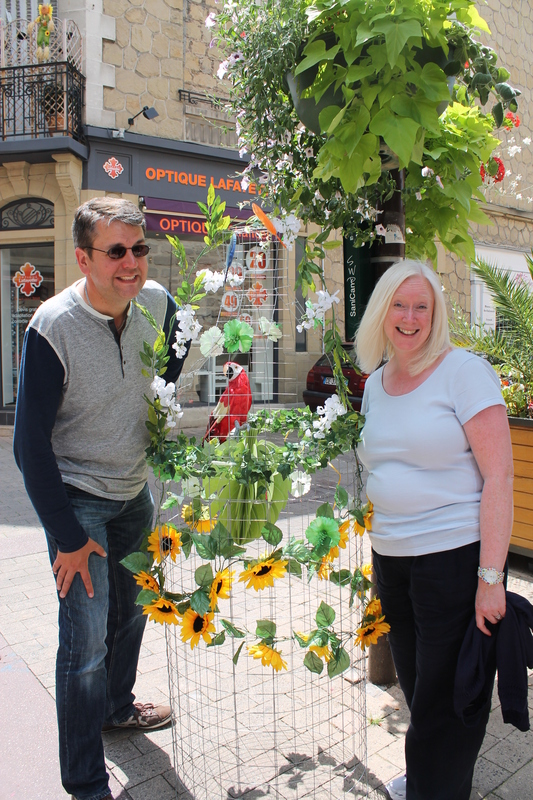 We visited SYlP and pottered about the shops. Francois in the Cave de Bacchaus will probably have realised that we take all our visitors to his place. 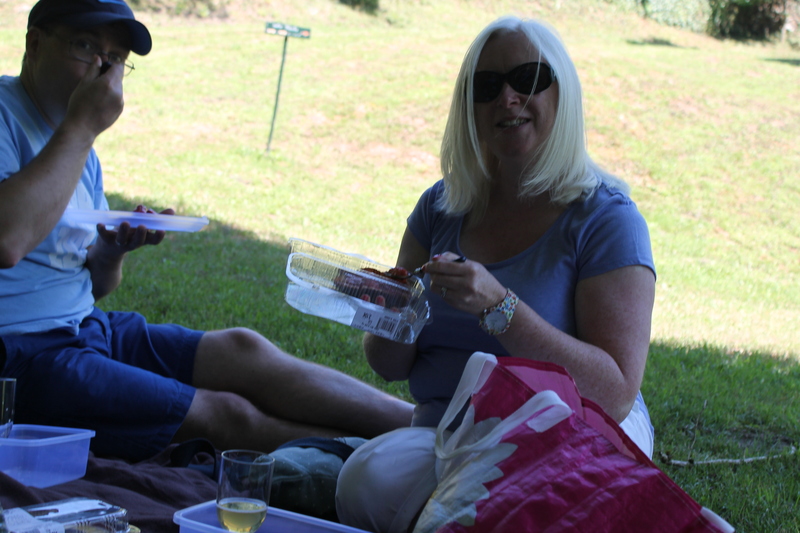 We are not yet however receiving any discounts/percentage… We barbequed for tea which was good, I was ably assisted by Gordon as we tucked into various lovely meat things. On the Wednesday we had a wander around a local park that has been various things including military manoeuvres/training. Having loaded up with picnic type provisions and cakes we had a lovely walk about the grounds of a rather nice modern (1901) chateau. The relaxed evening was slightly impacted by Mitzy bringing in a live mouse. D, G & S scampered about trying to catch it and keep her away from it while I spotted for them from the mezzanine. On the last day we took them to Brive, from where they were heading for Nice. We ate in a place where we could get fancy burgers (Gordon’s favourite food group) and I felt obliged to have the one with duck on it! Very nice. They paid as it was our tenth anniversary. 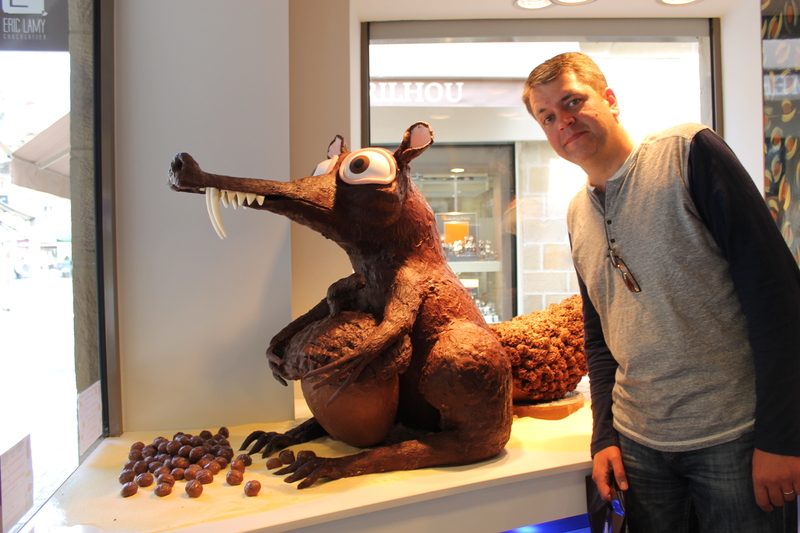 We wandered around the town centre and visited the chocolate shop which had excelled itself and the all chocolate boar last time with Scratch from Ice Age. (I am only in shot so you can both see how big it was). It smells superb in there and ‘sadly’ Fran and Mike are now fans too. After establishing that the train was their one and not the late previous one, after I made friends with a similarly confused woman, we waved them off. They had a great time in Nice. A quiet couple of days followed as we started thinking about our 20k move south. We were left in charge of the four chickens – all of which survived my care and attention. On the 21st if was the weekend of the Fete de la Music – where all across France there are free music events. SYlP had five different places where stuff was going on and we went to three of them. SYlP is a large village/small town and I’m constantly impressed by how much goes on here despite the small population. On Place de la Nation local line dancers were baking gently in the sun and the drunken observers were dragged on stage by older women for the audience participation bits. It was rather more fun than I would have thought and the atmosphere was really good. The music school were doing jazz in one of the Salle’s and the kids who made up half the band were doing well. Then onto the Place de la Marche, where I had a veal ciabatta and S had frites, there was a DJ and again the atmosphere was relaxed and convivial. We had a quiet few days and got more spuds, mint and a lettuce from John and Jill next door. We also drew up a list of what we want to do before we go, the clock is ticking after all, sniff. We have grouped a few things together for ease of visiting. On Wednesday we headed north to Fresselines where more Impressionists had hung out. Daftly we realised that the museum was opening on weekdays in July missing it by a few days. Wandering the village it was easy to see why Monet and his chums were inspired to remain there painting away in the sunshine… After a rather good and cheap menu de jour with a cheese course (& wine) in a nicely painted salon. We headed south and passing through Bourganeuf stopped at the Casade des Jarrauds. 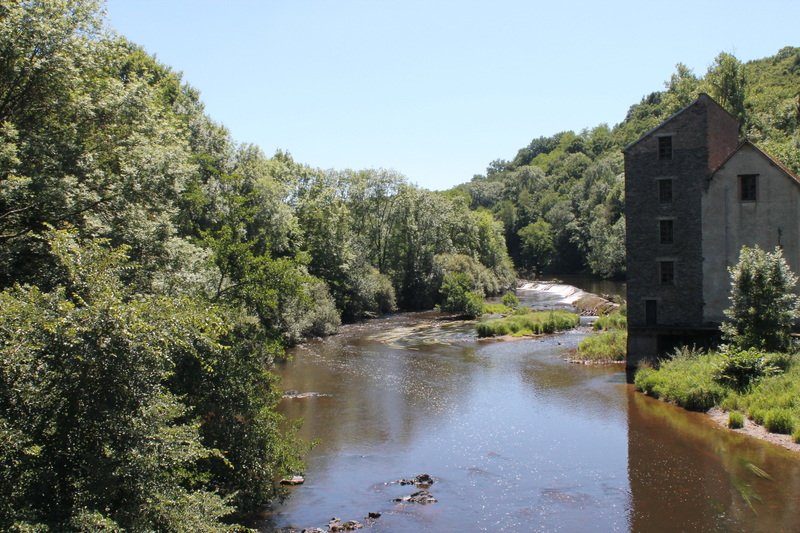 Bourganeuf is a nice town but was surprisingly one of the first places on the planet to have electricity courtesy of a local chap and said waterfall. By 1946 when the place was nationalised it had generated 1.46 million kilo hours (or similar) of power which was impressive in itself. 2 drips & many more! Heading for Mont Gargan a Maquis/Resistance stronghold we arrived in Peyrat le Chateau which we’d passed through before but not when they had filled the lake for the summer. 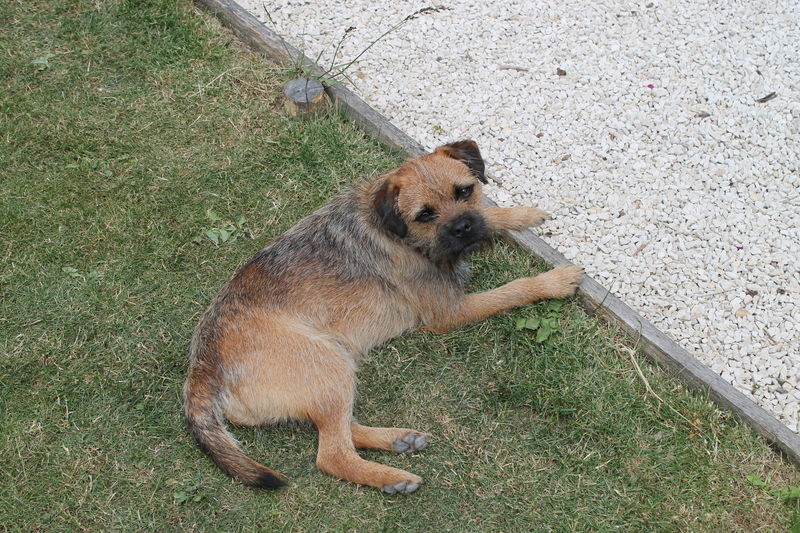 This will be done by blocking the small river rather than me, Archy and some buckets no doubt. Anyway, we went to the Resistance museum where a truly charming, slim, tanned French lass showed us around. A combination of my poor French and her little English worked well as we three chatted about the exhibits. Several thousand canisters of supplies dropped by the Allies to the many hundreds of local fighters in the hills and forests. Many of whom were living normal lives during the day and then off into the hills causing no end of havoc at night – despite the constant and very real threat of arrest, deportation to concentration camps or simply being shot. Again my respect for those who played their part no matter how small continues to grow and grow. Pausing for a drink in a place that happened to be run by Brits a patron mentioned what the Daily Mail would call the “hordes of immigrants” at Calais. I bit my tongue choosing not to lambast people who move to other countries seeking a better life out numbered as we were by ex-pats… Heading homeward we found the place we almost rented first and having had a good nose at it were both more than happy we instead inflicted ourselves on Jan and Keith at La Porcherie. Their view may however be different! Next was readying for the move. A trip to the Citroen garage resulted in roof bars for the top box and a visit the next day saw them fitted. All with only one word of English from the garage staff. J We noticed in the place a brake light had stopped working and that got changed for free – bonus. Having packed suitcases, boxes and bags we loaded up the car. Mike and I had discussed our departure the next day before S pointed out it was Thursday not Friday. He took the blow of another day of us without a flicker, good chap that he is. On our last night we wondered down to the lake and heard the frog chorus. It’s rather difficult to work out but there must be five or six different calls going at the same time, from high pitched to flatulent in nature. 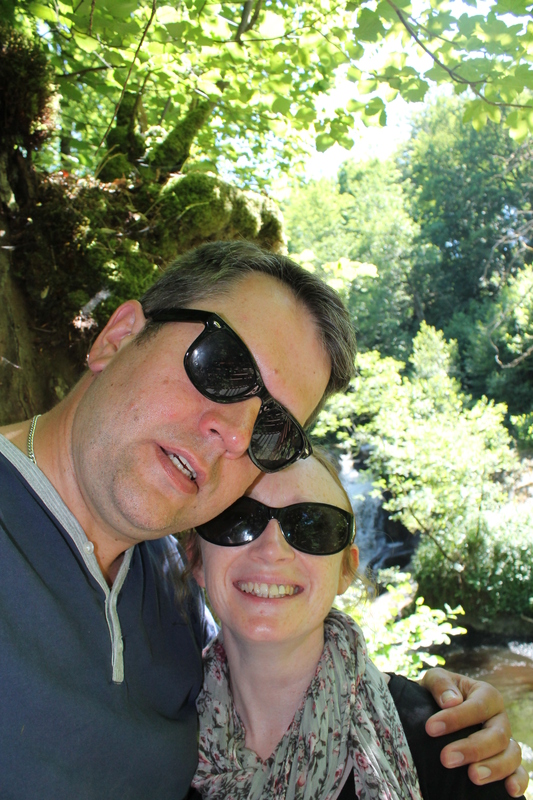 On Saturday we set off – as we feared with most of our stuff – to the next place. Arriving we were met by Rose and Roy then shuttled stuff into our new abode as Mitzy watched from the dreaded cat carrying box. I popped into Lubersac for provisions as S started getting the place ship shape. We returned to Biaugeas where Fran and Mike said lots of nice things about our time with them and invited us for dinner. They asked if I’d be back to do the weeding and put the bins out! 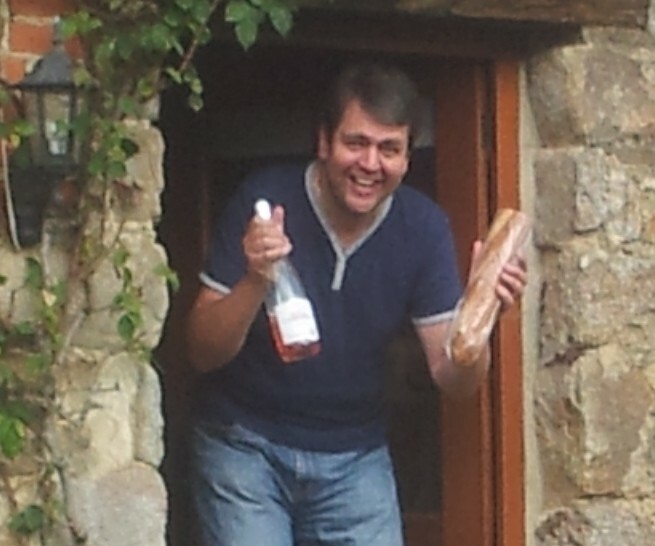 We’ve been very lucky with both sets of hosts so far, we’ll see them again partly cos I forgot the key for the wee hoose but for a nosh – Fran says she does a mean quiche which Mike and I were lobbying should be accompanied by duck breast! Archy had appeared to see us again, we’d popped around to have a chat with John and Jill the day before. 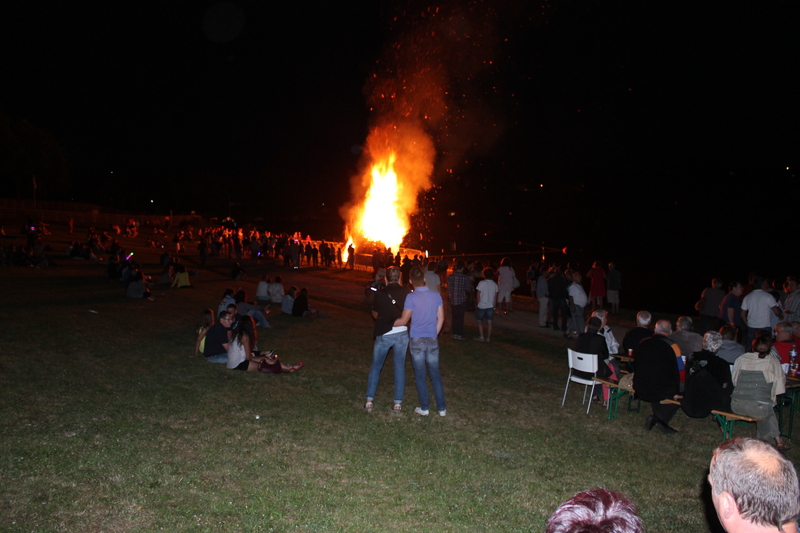 As we were near SYlP we headed along to the Lac for a Saint Jean event. The origin of which we don’t know but it dawned on me I (John) may be flung onto the wood pile before it was lit! 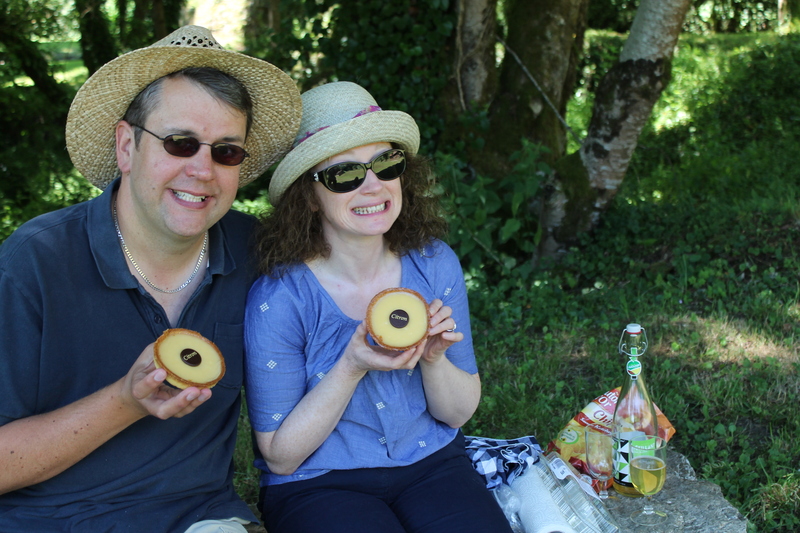 Anyway buying food – saucisson in a bagette for me & chips for both – we sat down with drinks at one of the long tables. The DJ was going and there was a real mix of people, some of whom we are beginning to recognise. A few players from the fitba were there and I had a word with one. A couple and their pal joined us on the table as their lad played football with his friends. The ball they were using ended up in the lac and his mum wasn’t too impressed with him wading in to get it. The other person’s man was working on the barbeque and appeared with free chips and saucisson which we were offered some of. By then a few comments had been exchanged, initiated by me in my usual bumbling fashion. We declined more main course but when the free pudding arrived politeness overtook us as S and I helped tidy away a rather nice bit of apple tart. Sadly they had no contact working on the bar but despite my best efforts they didn’t let us buy them drinks. We continued to have a few more words with them especially as the mother couldn’t get her glow stick bangle to stay on her wrist – the kids were scurrying about with multicoloured flashy light things as dusk fell. Many adults were wearing/holding the aforementioned bendy glow sticks all of which were handed out free. Rather to our surprise fireworks were set off at 2300 and the display was followed by the lighting of the wood pile which soon burnt brightly due to the hot dry weather of late. Again it was a great event and despite the bar being open four hours and the numbers of people there, at no point was the atmosphere anything other than relaxed and civilised.